Named as one of Newsweek Magazine’s 150 Fearless Women of the World, Congresswoman Jackie Speieropens a new window will visit our libraries to talk about her collective experiences as a widow, a mother, a congresswoman, and a fighter. Hear how her experiences have shaped her into becoming a vocal champion and tireless advocate for human and women’s rights in her new book Undaunted: Surviving Jonestown, Summoning Courage, and Fighting Back. Belmont: Charles Stoneopens a new window, Library JPA Governing Board Chair. Half Moon Bay: Marina Fraser, Foundation for San Mateo County Libraries Board President. Stay for a Q&A and book signing after her talk. Light refreshments will be served. 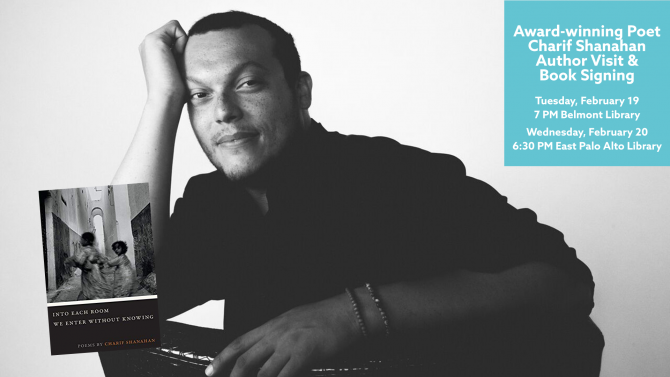 Charif Shanahanopens a new window is the author of Into Each Room We Enter Without Knowing (Crab Orchard Series in Poetry/SIU Press, 2017), which was named a finalist for the Lambda Literary Award for Gay Poetry and the Publishing Triangle's Thom Gunn Award for Gay Poetry. A Q&A and book signing will follow the poetry reading. Light refreshments will be served.